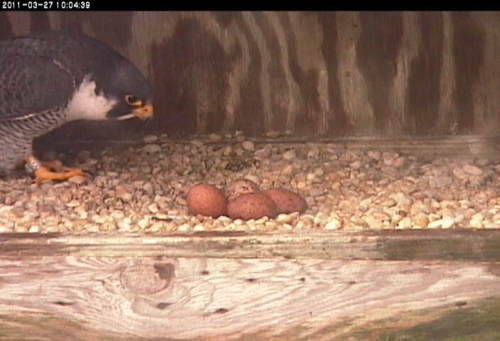 Views into the nestbox this morning revealed a fourth egg. Here we can see the male getting ready to settle in for his turn at incubating the eggs. This is a typical clutch for peregrine falcons and we won’t expect to see anymore. The next big question; of course – is when will they hatch? Peregrine falcons incubate their eggs for between 33-35 days. Incubation usually begins with the second to last egg. This year the pair began incubating regularly after the second egg. We’ll expect to see the eggs hatching in the last week of April.